An area covered with low value, unused grass may be an appropriate filter for distribution of rinsing water from the sprayer and an appropiate place to clean the outside of the sprayer and tractor. The grass hinders the agrochemical solution from moving away and encourages it to be chemically bonded to soil particles and subsequent degradation. Therefore it is advisable to have such an area - moved every year - nearby the farm. 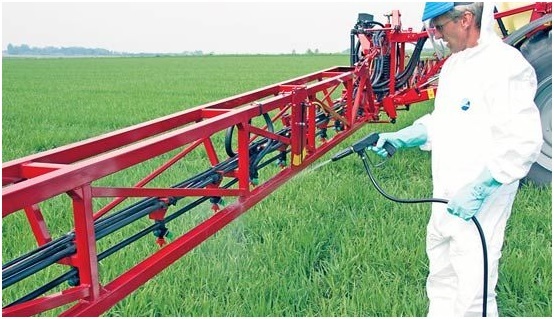 Another possibility for most sprayers involves having supplied or fitted, special equipment for external cleaning of the sprayer in the field. This - to be preferred - procedure is still being developed but some of the clean water in the dedicated rinsing tank has to be reserved for this extra purpose. Hoses with a high pressure supply are being used to rinse those areas of the machine that get the greatest level of contamination; the rear of the tank, the booms and wheels. The frequency at which external cleaning takes place will depend on factors such as spray quality and wind direction as well as exposure time and temperature. Todays evidence suggests that infield cleaning is likely to be a routine that should be done at the end of every spraying day. It is an activity that is of great importance for both personal and environmental safety when storing the sprayer.